It’s a new year and we’re starting it off strong with a powerful new Dark Elf with the Intelligence attribute: Renegade Magister! The first thing that stands out about Renegade Magister are its 5/5 stats. Intelligence creatures aren’t known for their raw stats, usually relying on cunning effects instead. Being a 5/5 already makes Renegade Magister one of the more powerful creatures in Intelligence in terms of power and health alone. 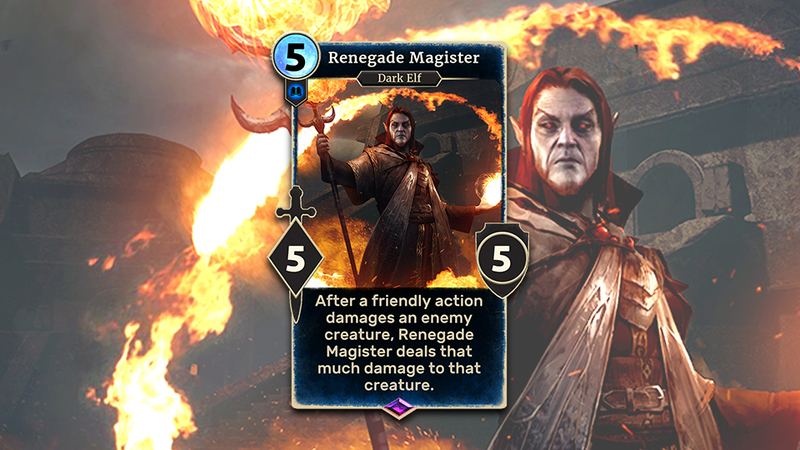 Renegade Magister is more than just a strong set of stats, however! This monthly card essentially doubles the amount of damage your actions deal to enemy creatures, making it another powerful option for decks using a lot of removal. Want to Firebolt a creature? Thanks to the Magister’s additional two damage, you’ll be able to take down a four-health creature like last month’s card, Ashlander Punisher in one shot! If you play the Magister on turn five and it survives a turn, you can follow up with Ice Storm to deal six damage to each enemy creature (while only doing three to your own!) That’s more damage than even Odahviing can dish out! You can earn copies of Renegade Magister based on your placements on the Elder Scrolls: Legends ladder. If you achieved rank nine or higher, you’ll get one copy at the beginning of next month; rank five will give you two copies and rank one or Legend will give you a full playset! You can always Soul Summon additional copies later, but make sure to head into the Ranked ladder today for a shot at earning yours for free!